"Somebody Ought to Write a Book About It"
(1966) "Here We Go Again"
(1967) "In the Heat of the Night"
"Here We Go Again" is a country music standard written by Don Lanier and Red Steagall that first became notable as a rhythm and blues single by Ray Charles from his 1967 album Ray Charles Invites You to Listen. It was produced by Joe Adams for ABC Records/Tangerine Records. To date, this version of the song has been the biggest commercial success, spending twelve consecutive weeks on the US Billboard Hot 100 chart, peaking at number 15. The most notable cover version is a duet by Charles and Norah Jones, which appeared on the 2004 album Genius Loves Company. This version has been the biggest critical success. After Genius Loves Company was released, "Here We Go Again" earned Grammy Awards for Record of the Year and Best Pop Collaboration at the 47th Grammy Awards in February 2005, posthumously for Charles, who died before the album's release. Another notable version by Nancy Sinatra charted for five weeks in 1969. Johnny Duncan charted the song on Billboard's Hot Country Songs chart for five weeks in 1972, while Roy Clark did so for seven weeks in 1982. The song has been covered in a wide variety of musical genres. In total, five different versions have been listed on the music charts. Although its two most successful versions have been rhythm and blues recordings, many of its other notable covers were featured on country music albums. "Here We Go Again" was first covered in an instrumental jazz format, and many of the more recent covers have been sung as duets, such as one with Willie Nelson and Norah Jones with Wynton Marsalis accompanying. 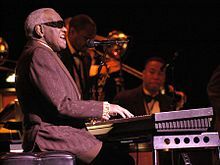 The song was released on their 2011 tribute album Here We Go Again: Celebrating the Genius of Ray Charles. The song lent its name to Red Steagall's 2007 album as well. Cover versions have appeared on compilation albums by a number of artists, even some who did not release "Here We Go Again" as a single. In November 1959, after twelve years as a professional musician, Ray Charles signed with ABC Records, following the expiration of his Atlantic Records contract. According to Will Friedwald in A Biographical Guide to the Great Jazz and Pop Singers, "His first four ABC albums were all primarily devoted to standards..." In the 1960s, he experienced crossover success with both rhythm and blues and country music. Because Charles was signed to ABC as a rhythm and blues singer, he decided to wait until his contract was up for its three-year renewal before experimenting with country music, although he wanted to do so sooner. With the assistance of ABC executive Sid Feller, he gathered a set of country songs to record, despite the wishes of ABC. The release of his 1962 country albums Modern Sounds in Country and Western Music and its follow-up Modern Sounds in Country and Western Music, Vol. 2 broadened the appeal of his music to the mainstream. At this point, Charles began to appeal more to a white audience. In 1962 he founded his own record label, Tangerine Records, which ABC-Paramount promoted and distributed. "Here We Go Again" was recorded during a phase in Charles' career when he was focused on performing country music. 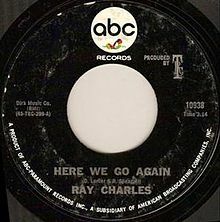 Thus, "Here We Go Again" was a country music song released by the Tangerine label ABC-Paramount, but performed in Charles' rhythm and blues style. However, his works did not bear the Tangerine label until 1968. Feller left ABC in 1965, but he returned to arrange Charles' 1967 album, Ray Charles Invites You to Listen. Joe Adams produced and engineered the album, which included "Here We Go Again". First released by Charles in 1967, "Here We Go Again" was written by Lanier and Steagall and published by the Dirk Music Company. Charles recorded it at RPM International Studios, Los Angeles, and the song was listed as the sixth of ten tracks on Ray Charles Invites You to Listen. Starting in 1987, it was included in numerous greatest hits and compilation albums. When Modern Sounds in Country and Western Music was reissued in 1988, the song was added as a bonus track. It was also included on the 1988 album Ray Charles Anthology. Ray Charles' "Here We Go Again" from Ray Charles Invites You to Listen is the first notable cover of the song. It is a rhythm and blues version from the part of Charles's career when he was recording country music. Steagall endured polio as a teen and learned how to play the guitar and mandolin during his recuperation. This activity helped him regain the use of his left arm and hand. When he enrolled at West Texas State University, he formed his first country band. Don Lanier formed a group by the name of The Rhythm Orchids along with Buddy Knox and Jimmy Bowen. He was hired as a soil chemist but played weekends at country dances. After he quit his professional role, he formed a band that became popular in the Rocky Mountain ski-resort clubs. He moved to Los Angeles in 1965 and embarked on folk club performing and songwriting. He wrote for two music publishers, Tree and Combine, before signing with Capitol Records. Eventually, Steagall joined Lanier and Bowen. Steagall and Lanier co-wrote "Here We Go Again". Steagall's first break came when Charles covered "Here We Go Again". Steagall says that the song "came about in a very unusual manner and very quickly". One source even claims that Steagall did not come to Hollywood until after Charles recorded the song. According to the sheet music published by Dirk Music, "Here We Go Again" is set in 12/8 time with a slow shuffle tempo of sixty-nine beats per minute. The song is written in the key of B♭ major. It is primarily a country song, but contains gospel influences. According to Matthew Greenwald of Allmusic, "'Here We Go Again' is a soulful ballad in the Southern blues tradition. Lyrically, it has a resignation and pain that makes the blues, simply, what it is. The recording has a simple and sterling gospel arrangement and, in retrospect, is one of Charles' finer attempts in the studio from the 1960s." The playlist of the 1967 tour promoting Ray Charles Invites You to Listen is not readily available, but "Here We Go Again" was the best-charting song on the album (and likely on the playlist). Charles' tour began with a benefit concert on the USS Constellation, which was preparing to depart for the Vietnam War from San Diego Harbor. The tour, Charles' first since 1964, continued to Europe in mid-April where it visited the Royal Festival Hall, London and Salle Pleyel, Paris, as well as Vienna. In May, the band played back in the United States at New York City's Carnegie Hall before returning to California. The tour received bad reviews from publications such as Jazz Journal, Jazz Magazine and the New York Post. Later that summer, the band played Constitution Hall, Washington, D.C. In the fall, Charles had his first lucrative Nevada casino performances, which started with a three-week run at Harrah's Reno that was praised in Variety. The tour also had an extended fall run at New York's Copacabana nightclub. Greenwald described the original version of "Here We Go Again" as "Another excellent example of how Ray Charles was able to fuse blues and country". In a review for the single, a writer for Billboard magazine wrote that the song could easily be a "blockbuster" for Charles. The original version debuted at number 79 on the Billboard Hot 100 chart in the May 20, 1967, issue and number 48 on the US Billboard Hot Rhythm & Blues Singles top 50 chart on June 10, 1967. For the weeks ending July 15, 22 and 29, the song spent three weeks at its peak position of number 15 on the Hot 100 chart. It spent July 22 and 29 at its peak position of number 5 on the Hot Rhythm & Blues Singles chart. By August 12, it fell out the Hot 100 chart, ending a 12-week run. It remained on the Hot Rhythm & Blues Singles chart for 13 weeks ending on September 2. "Here We Go Again" was Charles' last single to enter the top twenty of the Hot 100. For the year 1967 the song finished at number 80 on the US Billboard Year-End Hot 100 chart and 33 on the Year-End Hot Rhythm & Blues Singles chart. Abroad, it debuted on the UK Singles Chart top 40 at number 38 on July 8, 1967, which would be its peak. It totalled 3 non-consecutive weeks on the chart. In the Netherlands, "Here We Go Again" appeared on the singles chart at number 10 on July 15, 1967, and later peaked at number three. According to Will Friedwald, this song is an example of Charles vocalizing in what would ordinarily be a generally extraneous manner for dramatic effect by using a different voice than he had ever previously exhibited. He sang "... not just using the squeak—using a whole new kind of squeak, in fact—for additional coloring on the sidelines, but making it the heart of the matter, literally squeaking out the words and notes in harmony with the Raelettes" (his background singers). According to Allmusic, the solo version is listed at lengths between 3:14 and 3:20 on various albums. Charles is credited as vocalist and pianist with unknown accompaniment. Feller is credited for having arranged and conducted the recording. This is one of two songs on the album ("Yesterday" being the other) that in addition to being listed as ABC-Par ABC595 is credited as Dunhill DZS036 [CD]. The individual song had a label number ABC/TRC 10938. "In the Heat of the Night" also had a Dunhill credit but a different number for both Dunhill and ABC. "God Knows I Love You"
(1968) "Here We Go Again"
Nancy Sinatra recorded a cover of the song for her 1969 album Nancy, which was her first album after ending her business relationship with producer Lee Hazlewood. The cover, which according to programming guides had an easy listening and country music appeal, was produced by Billy Strange. The B-side to the single, "Memories", was written by Strange along with Mac Davis. Billboard magazine staff reviewed the song favorably, stating that the cover was a "smooth sing-a-long pop style". They also commended Sinatra's singing, calling it a "fine" performance, noting that it would likely return her to the Billboard charts. Sinatra's version was later remastered and reissued in 1996. Although CD Universe describes the song as a country music song, it never charted on country music charts. For the week ending May 17, 1969, the song was listed among US Billboard Bubbling Under Hot 100 Singles chart at number 106 and debuted on the US Billboard Easy Listening Top 40 chart at number 30. The following week it debuted on the US Billboard Hot 100 chart at number 98, its apex for its two-week stay. The song then spent a total of two weeks on the Hot 100. For the week ending June 7, the song spent a second consecutive week at its peak position of number 19 on the Easy Listening chart. The song remained on the chart for five weeks until June 14, 1969. 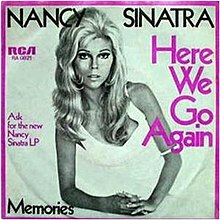 In Canada "Here We Go Again" debuted at number 38 on the RPM Adult Contemporary chart (previously Young Adult Chart) on June 2, 1969. It peaked at number 21 for the week of June 16, 1969. The song spent a total of five weeks on the chart. According to Allmusic databases, 1969 was the final year in her career that Sinatra reached the Hot 100 chart (with "Here We Go Again", "God Knows I Love You" and "Drummer Man"). According to Allmusic the original track was 3:09, but when it appeared on the 2006 compilation album Essential Nancy Sinatra, it was 3:11. The single was initially released through Reprise Records. In a non-exclusive licensing agreement, Reprise (part of Warner Music) gave RCA Records the rights to distribute the records of some of their artists including Sinatra and Dean Martin. In 1971, Sinatra and Reprise parted ways, so she signed a long-term contract with RCA Records. (2002) "Here We Go Again"
(2005) "You Don't Know Me"
(2004) "Here We Go Again"
In 2004, Charles re-recorded "Here We Go Again" as a duet with American singer-songwriter Norah Jones, who grew up listening to his music. During Jones' Billboard interview for her 2010 collaboration album ...Featuring, which included her "Here We Go Again" duet, she said "I got a call from Ray asking if I'd be interested in singing on this duets record. I got on the next plane and I brought my mom. We went to his studio and did it live with the band. I sang it right next to Ray, watching his mouth for the phrasing. He was very sweet and put me at ease, which was great because I was petrified walking in there." She noted in one ...Featuring interview that the only part that was not done live was a piano overlay that she added afterwards to complement Charles' keyboard. In the same interview, she noted that she had been given the opportunity to select a song from Charles' songbook to perform as a duet and felt that this one provided the best opportunity to harmonize rather than alternate vocal verses. On the record, the two singers vocalize, accompanied by Billy Preston on Hammond organ, who had at one time been the regular organist in Charles' band. As part of Charles' Grammy Award for Album of the Year-winning Genius Loves Company, the song proved to be the most popular and critically acclaimed on the album. Although the song had its early detractors, it received mostly favorable reviews. Several reviewers noted the complementarity of Jones and Charles. The Daily Vault's Jason Warburg described the song as a "jazzy, slinky pas de deux" in which Charles matches Jones note for note." JazzTimes' Christopher Loudon said Charles "blends seamlessly with Jones on a velvet-and-buckram" performance. The song was described by the Orlando Sentinel's Jim Abbott as a recreation of one of the gems from Charles' country music phase of the 1960s that produced the perfect "combination of voices and instruments" with Preston's accompanying role on Hammond B3. As opposed to other tracks on the album, when Charles' voice was understated, this song was said to represent his "indomitable spirit", while Jones performed as "an empathetic foil, [with] her warm, lazy vocals meshing convivially with his over a spare but funky arrangement". Author Mike Evans wrote that "there's a mutual warmth of purpose in every breath [Charles and Jones] take" on the song. Music Week staff noted the timeliness of the release with the biographical film Ray in theaters and described the song as soulful, that finely combines Charles' "deep, honeyed growl with Jones's lighter timber", while noting Preston for his "sweeping" organ work. The song received other specific forms of praise. Robert Christgau notes that Jones carried the vocal burden as did many of Charles's duet partners on the album. USA Today's Steve Jones said the song "strikes an easy groove". PopMatters' Kevin Jagernauth says "Jones nicely compliments Charles on this beautiful opening track". Preston's performance was favorably described by The Washington Post's Richard Harrington as "smoky". Critic Randy Lewis from the Chicago Tribune noted that the song's "countrified ache" represented that part of Charles' career. When the song was included on Jones' ...Featuring, which included three of her collaborations from Albums of the Year and several from albums that were nominees, the song did not stand out. Few of the reviews at Metacritic had substantive comments on the duet when included among her group of collaborations. While reviewing ...Featuring, Jonathan Keefe of Slant Magazine wrote that the duet was a "more staid and less compelling recording" on the album. However, Allmusic staff noted that she worked comfortably with Charles and Chris Rizik of Soul Tracks said the track was more than just filler. The Jones–Charles version was the first notable duet vocals version and earned Grammy Awards for Record of the Year and Best Pop Collaboration with Vocals (posthumously for Charles). In December 2004, the Jones–Charles version of the song was nominated in two categories at the 47th Grammy Awards. At the February 13, 2005 awards ceremony, the duet earned the award for Record of the Year and Best Pop Collaboration with Vocals. It was the second Record of the Year winner not to make the Hot 100 (following "Walk On" in 2001 by U2). The song won Record of the Year, but not Song of the Year. Record of the Year is awarded to the artist(s), producer(s), recording engineer(s) and/or mixer(s), if other than artist for newly recorded material. Song of the Year is awarded to the songwriter(s) of a new song or a song first achieving prominence during the eligibility year. Steagall and Lanier are credited as the writers of this song from their work on its original version in 1967. Thus, the song was not a new song. For the week ending September 18, 2004, Genius Loves Company sold 202,000 copies, ranking second on the US Billboard 200 chart and becoming Charles' highest-charting album in over 40 years. Digital singles sales saw 12 of the 13 tracks on the album make the US Billboard Hot Digital Tracks Top 50 chart. "Here We Go Again" was the download sales leader among the album's songs that totaled 52,000 digital downloads. During the week the album was released, the song debuted on the US Billboard Hot Digital Tracks chart at number 26. "Here We Go Again" fell out of the top 50 two weeks later. It was released as a single for digital download on January 31, 2005. After the album earned eight Grammy Awards and the song won Record of the Year, sales picked up and the album was re-promoted. "Here We Go Again" entered the US Billboard Bubbling Under Hot 100 chart at number five in the issue dated (for the week ending) February 26, 2005. The song charted for a week on both the US Billboard Hot Digital Songs top 75 at number 73 and the US Billboard Pop 100 at number 74 for the week ending March 5, 2005, but still did not make the Hot 100, ranking 113th before falling out of the chart. However, it ascended to its Bubbling Under Hot 100 chart peak position of number two for the week ending March 5, 2005. A compact disc single of the song was released on April 19, 2005. In Austria, the duet debuted on the Ö3 Austria Top 40 chart at number 53 on March 6, 2005, and peaked the following week at number 52. It logged six weeks on the chart. "Here We Go Again" entered the French Singles Chart at number 54 on April 2, 2005 and peaked one week later at number 51. It lasted 10 weeks on the top 100 chart. According to Allmusic, the duet version was between 3:56 and 3:59 on various albums. The song was recorded at RPM International Studio (Los Angeles), mixed at Capitol Studios and mastered at the Mastering Lab. Johnny Duncan charted a version of the song for Columbia Records that missed the Hot 100 chart. It debuted on the Hot Country Songs chart on September 30, 1972, peaking at number 66 and spending a total of five weeks on the chart. The song also spent five weeks on the Cashbox Country Singles Chart, debuting on October 7, 1972, and peaking at number 61 three weeks later. In 1982, Roy Clark produced a version of the song on his Turned Loose album for Churchill Records that he performed on the November 6, 1982 (season 15, episode 9), episode of Hee Haw. It missed the Hot 100 chart, but it entered the Hot Country Songs chart for the week ending October 30, 1982, at 88. The song was one of only two mentioned in the October 30, 1982, Billboard album review and was described as "a solid country number". The song peaked at number 65 in the week ending November 27 and remained in the chart for two more weeks, making the total run seven weeks. The song also spent seven weeks on the Cashbox Country Singles Chart, debuting on November 6, 1982, and peaking at number 61 for two weeks (December 4 and 11). Billy Vaughn covered "Here We Go Again" on his 1967 Ode to Billy Joe instrumental album, as did Dean Martin on his 1970 album My Woman, My Woman, My Wife. Glen Campbell's version appeared on his 1971 album The Last Time I Saw Her, Eddy Arnold's on his 1972 album Lonely People, and George Strait's on his 1992 album Holding My Own. Steagall performed it with Reba McEntire on his 2007 Here We Go Again album, but she did not include it on her 2007 duets album Reba: Duets, which was released four weeks later. Their collaboration was favorably reviewed, and McEntire was said to reinvigorate this country standard by Nathalie Baret of ABQ Journal. Martin's version was 3:07, and it later appeared on compilation albums, starting with the 1996 Dean Martin Gold, Vol. 2. It has appeared on a handful of other Martin compilation albums. Campbell's version was only 2:26. Strait's version is 2:53 and appears later on his 2004 Greatest Collection at a 2:55 length. Steagall's version with McEntire (who Steagall discovered at a 1974 county fair) is 3:10. R&B and boogie-woogie pianist and singer Little Willie Littlefield recorded a version for his 1997 album The Red One. Peters and Lee made a version of the song on their 1976 on their Serenade album. Joe Dolan produced a 1972 single of the song that he included on his 1976 album Golden Hour Of Joe Dolan Vol. 2 and several of his greatest hits albums. Willie Nelson and Wynton Marsalis, along with Norah Jones, performed two concerts at Lincoln Center's Rose Theatre on February 9 and 10, 2009. A 2011 live tribute album by Nelson and Marsalis featuring Jones entitled Here We Go Again: Celebrating the Genius of Ray Charles was recorded on these two live dates. The album, which was released on March 29, 2011, included a track entitled "Here We Go Again". The vocals on "Here We Go Again" were performed by Jones and Nelson, while instrumental support was provided by Marsalis (trumpet), Dan Nimmer (piano), Mickey Raphael (harmonica), Walter Blanding (tenor saxophone), Carlos Henriquez (bass) and Ali Jackson (drums and percussion). The song, which had a length of 5:10, was arranged by Andy Farber and performed in a rhythm and blues 12/8 shuffle. BBC music reviewer Bill Tilland noted that Jones added her usual "style and panache" to this performance. At one concert performance, The New York Times critic Nate Chinen felt the song sounded unrehearsed. Although critique of this track is sparse, Pop Matters's Will Layman notes that the album reveals "how decisive and strong Jones sounds while singing with a truly legitimate jazz group" and how Nelson predictably "breezes through his tunes with cavalier grace". Meanwhile, he praises the professional mastery of Marsalis' quintet. Tilland also notes that on the album Marsalis' band "compensates quite adequately for occasional lacklustre vocals." George Strait's country music version was performed with the instrumental support of Joe Chemay (bass guitar), Floyd Domino (piano), Buddy Emmons (steel guitar), Steve Gibson (acoustic guitar), Johnny Gimble (fiddle), Jim Horn (saxophone, alto flute), Larrie Londin (drums), Liana Manis (background vocals), Curtis Young (background vocals), and Reggie Young (electric guitar). The album was produced by Jimmy Bowen and Strait. In 1992 Entertainment Weekly's Alanna Nash regarded the album as Strait's "most hard-core country album" up to that point in his career. Allmusic staff noted that the album held its own at the time of release against most of its competitors and has aged better than most country music albums. Ralph Novak, Lisa Shea, Eric Levin, and Craig Tomashoff of People said the album represents the most straightforward style of singing. The iTunes Store describes the album as the result of a transition in eras of country music. The song plays during the opening credit dance by Franz (Harry Baer) and Margarethe (Margarethe von Trotta) in Rainer Werner Fassbinder's 1970 film Gods of the Plague. However, the song was on neither the eponymous soundtrack for the 2004 film Ray nor the limited edition additional soundtrack album More Music From Ray. ^ Charles & Ritz 2004, pp. 196–97. ^ a b Friedwald, Will (2010). A Biographical Guide to the Great Jazz and Pop Singers. Pantheon Books. pp. 78–80. ISBN 0375421491. ^ Charles & Ritz 2004, p. 222. ^ Charles & Ritz 2004, p. 223. ^ Charles & Ritz 2004, p. 248. ^ Lydon 1998, pp. 213–16. ^ a b Abbott, Jim (August 31, 2004). "Distinctive Sound Of Genius: Music Review: The Final Album From Ray Charles Isn't Stellar, But It's A Pleasant Listening Experience Just The Same". Orlando Sentinel. Tribune Company. Retrieved May 13, 2011. ^ Charles & Ritz 2004, p. 354. ^ Lydon 1998, p. 260. ^ a b Lydon 1998, p. 268. ^ "Here We Go Again (Legal Title)". Broadcast Music Incorporated. Archived from the original on July 19, 2012. Retrieved May 8, 2011. ^ a b "Ray Charles – Modern Sounds in Country and Western Music". Discogs. Retrieved May 8, 2011. ^ "Ray Charles Invites You to Listen -..." Billboard. Prometheus Global Media. Retrieved May 8, 2011. ^ "Ray Charles Invites You To Listen". Amazon.com. Retrieved May 8, 2011. ^ a b c "Here We Go Again". Allmusic. Rovi Corporation. Retrieved May 8, 2011. ^ Whitburn, Joel (2006). The Billboard Albums (6th ed.). Record Research. pp. 191–192. ISBN 0-89820-166-7. ^ a b c Carlin, Richard (2002). Country Music: A Biographical Dictionary. Routledge. p. 385. ISBN 0415938023. ^ Woodstra, Chris; Stephen Thomas Erlewine; Vladimir Bogdanov; Michael Erlewine, eds. (1997). All Music Guide to Country: The Experts' Guide to the Best Country Recordings. Backbeat Books. p. 447. ISBN 0879304758. ^ a b c Jameson, W. C. (2008). Notes from Texas: on writing in the Lone Star State. Texas Christian University Press. pp. 208–9. ISBN 0875653588. ^ a b Shestack, Melvin (1974). The Country Music Encyclopedia. Thomas Y. Crowell Company. p. 265. ISBN 0-690-00442-7. ^ Larkin, Colin (1998). The Virgin encyclopedia of country music. Virgin Publishing. p. 405. ISBN 0753502364. ^ Kingsbury, Paul, ed. (2004). The Encyclopedia of Country Music: The Ultimate Guide to the Music. Oxford University Press. pp. 505–6. ISBN 0195176081. ^ "Ray Charles – Here We Go Again Sheet Music". Musicnotes.com. Dirk Music. Retrieved May 9, 2011. ^ a b "Top 60 Spotlights". Billboard. Nielsen Business Media, Inc. 79 (18): 20. May 6, 1967. ISSN 0006-2510. Retrieved May 8, 2011. ^ a b Jagernauth, Kevin (August 31, 2004). "Ray Charles". PopMatters. PopMatters Media, Inc. Retrieved May 12, 2011. ^ a b "Here We Go Again: Ray Charles". Allmusic. Rovi Corporation. Retrieved May 10, 2011. ^ Lydon 1998, pp. 268–72. ^ "Hot 100: For week ending May 20, 1967". Billboard. Nielsen Business Media, Inc. 79 (20): 20. May 20, 1967. ISSN 0006-2510. Retrieved May 8, 2010. ^ "Top Selling R & B Singles: Billboard Special Survey for week ending June 10, 1967". Billboard. Nielsen Business Media, Inc. 79 (23): 30. June 10, 1967. ISSN 0006-2510. Retrieved May 8, 2010. ^ "Hot 100: For week ending July 22, 1967". Billboard. Nielsen Business Media, Inc. 79 (29): 24. July 22, 1967. ISSN 0006-2510. Retrieved May 8, 2010. ^ "Hot 100: For week ending July 29, 1967". Billboard. Nielsen Business Media, Inc. 79 (30): 22. July 29, 1967. ISSN 0006-2510. Retrieved May 8, 2010. ^ "Top Selling R & B Singles: Billboard Special Survey for week ending July 22, 1967". Billboard. Nielsen Business Media, Inc. 79 (29): 34. July 22, 1967. ISSN 0006-2510. Retrieved May 8, 2010. ^ "Top Selling R & B Singles: Billboard Special Survey for week ending July 29, 1967". Billboard. Nielsen Business Media, Inc. 79 (30): 30. July 29, 1967. ISSN 0006-2510. Retrieved May 8, 2010. ^ "Hot 100: For week ending August 12, 1967". Billboard. Nielsen Business Media, Inc. 79 (32): 24. August 12, 1967. ISSN 0006-2510. Retrieved May 8, 2010. ^ "Hot 100: For week ending September 2, 1967". Billboard. Nielsen Business Media, Inc. 79 (35): 39. September 2, 1967. ISSN 0006-2510. Retrieved May 8, 2010. ^ "Top Selling R&B Singles: Billboard Special Survey for week ending September 9, 1967". Billboard. Nielsen Business Media, Inc. 79 (36): 39. September 9, 1967. ISSN 0006-2510. Retrieved May 8, 2010. ^ Evans 2005, p. 209. ^ "Top Records of 1967 (Based on Billboard Charts)". Billboard. Nielsen Business Media, Inc. 79 (52): 42. December 30, 1967. ISSN 0006-2510. Retrieved May 9, 2011. ^ "Top 40 Official UK Singles Archive: 8th July 1967". The Official Charts Company. Archived from the original on March 3, 2011. Retrieved May 8, 2011. ^ "Here We Go Again". Chart Stats. Retrieved May 8, 2011. ^ "Ray Charles". The Official Charts Company. Archived from the original on February 4, 2013. Retrieved May 9, 2011. ^ "Ray Charles – Here We Go Again". Dutchcharts.nl. Hung Medien. Retrieved May 9, 2011. ^ a b Lord, Tom (1992). The Jazz Discography. 4. Lord Music Reference Inc. p. C253. ISBN 1-881993-03-5. ^ Whitburn, Joel (2006). The Billboard Book of Top 40 R&B And Hip-Hop Hits. Billboard Books. p. 99. ISBN 0-8230-8283-0. ^ a b Whitburn, Joel (2009). Top Pop Singles (12th ed.). Nielsen Business Media. p. 179. ISBN 0-89820-180-2. ^ a b c "Nancy Sinatra – Nancy CD". CD Universe. Retrieved August 6, 2011. ^ "Programming Aids". Billboard. Nielsen Business Media, Inc. 81 (21): 30. May 24, 1969. ISSN 0006-2510. Retrieved May 10, 2011. ^ a b Sinatra, Nancy (1969). Nancy (Vinyl). Nancy Sinatra. Germany: Reprise. RS 6333. ^ a b c d "Special Merit Spotlight". Billboard. Nielsen Business Media, Inc. 81 (16): 77. April 19, 1969. ISSN 0006-2510. Retrieved May 9, 2011. ^ "Nancy [Original recording reissued, Original recording remastered]". Amazon.com. Retrieved May 9, 2011. ^ "Bubbling Under The Hot 100". Billboard. Nielsen Business Media, Inc. 81 (20): 82. May 17, 1969. ISSN 0006-2510. Retrieved May 9, 2011. ^ "Billboard Top 40 Easy Listening". Billboard. Nielsen Business Media, Inc. 81 (20): 73. May 17, 1969. ISSN 0006-2510. Retrieved May 9, 2011. ^ "Billboard Hot 100 For Week Ending May 24, 1969". Billboard. Nielsen Business Media, Inc. 81 (21): 58. May 24, 1969. ISSN 0006-2510. Retrieved May 9, 2011. ^ Whitburn, Joel (2009). Top Pop Singles (12th ed.). Nielsen Business Media, Inc. p. 894. ISBN 0-89820-180-2. ^ "Charts Search". Billboard. Nielsen Business Media, Inc. Retrieved May 9, 2011. ^ "Billboard Top 40 Easy Listening". Billboard. Nielsen Business Media, Inc. 81 (23): 64. June 7, 1969. ISSN 0006-2510. Retrieved May 9, 2011. ^ "Billboard Top 40 Easy Listening". Billboard. Nielsen Business Media, Inc. 81 (24): 74. June 14, 1969. ISSN 0006-2510. ^ "Billboard Top 40 Easy Listening". Billboard. Nielsen Business Media, Inc. 81 (25): 82. June 21, 1969. ISSN 0006-2510. ^ "RPM Young Adult". RPM. RPM Music Publications. 11 (14). June 2, 1969. ISSN 1196-6351. Archived from the original on October 22, 2012. Retrieved May 17, 2011. ^ "RPM Young Adult". RPM. RPM Music Publications. 11 (16). June 16, 1969. ISSN 1196-6351. Archived from the original on October 23, 2012. Retrieved May 17, 2011. ^ "RPM Young Adult". RPM. RPM Music Publications. 11 (17). June 23, 1969. ISSN 1196-6351. Archived from the original on October 22, 2012. Retrieved May 17, 2011. ^ "RPM Young Adult". RPM. RPM Music Publications. 11 (18). June 30, 1969. ISSN 1196-6351. Archived from the original on October 22, 2012. Retrieved May 17, 2011. ^ "Nancy Sinatra: Billboard Singles". Allmusic. Rovi Corporation. Retrieved May 9, 2011. ^ "Here We Go Again: Nancy Sinatra". Allmusic. Rovi Corporation. Retrieved May 10, 2011. ^ "WB-7 line to RCA's Club". Billboard. Nielsen Business Media, Inc. 80 (17): 11. April 27, 1968. ISSN 0006-2510. Retrieved May 14, 2011. ^ Haber, Joyce (October 13, 1971). "'Funny Face' Sandy Has Great Rating, Marital Split". Sarasota Journal. Lindsay Newspapers Inc. p. 19. Retrieved May 14, 2011. ^ a b c d Harrington, Richard (September 1, 2004). "From the Genius, Last Gleamings At Twilight". The Washington Post. The Washington Post Company. p. C1. Retrieved May 13, 2011. ^ "'Featuring' Norah Jones Track-By-Track". Billboard. Prometheus Global Media. November 10, 2010. Retrieved May 8, 2011. ^ "Norah Jones – Here We Go Again (...Featuring) ft. Ray Charles". Artist Direct. Rogue Digital, LLC. Retrieved August 6, 2011. ^ Concepcion, Pocholo (February 22, 2005). "Genius Loves Company". Philippine Daily Inquirer. Philippine Daily Inquirer, Inc. Retrieved May 13, 2011. ^ a b Evans 2005, p. 278. ^ a b Jones, Steve (August 30, 2004). "Charles' final notes are 'Genius'". USA Today. Gannett Company, Inc. Retrieved May 12, 2011. ^ Printz, Larry (September 4, 2004). "Ray Charles 'Genius Loves Company'". The Morning Call. Tribune Company. Retrieved May 13, 2011. ^ Farber, Jim (August 31, 2004). "His Musical 'Genius,' Paired Down". New York Daily News. Mortimer Zuckerman. Retrieved May 13, 2011. ^ Warburg, Jason (August 31, 2004). "Genius Loves Company". The Daily Vault. Jason Warburg and The Daily Vault. Retrieved May 12, 2011. ^ Loudon, Christopher (September 2004). "Ray Charles: Genius Loves Company". JazzTimes. JazzTimes. Retrieved May 12, 2011. ^ "Reviews: Records released 31.01.05: Ray Charles with Norah Jones". Music Week. United Business Media: 37. January 22, 2005. ISSN 0265-1548. ^ Christgau, Robert (September 2004). "Robert Christgau: Dean of American Rock Critics". Robertchristgau.com. Retrieved May 12, 2011. ^ Lewis, Randy (September 3, 2004). "Ray Charles is in good company on final CD". Chicago Tribune. Tribune Company. Retrieved May 13, 2011. ^ Dezeme (April 26, 2011). "Music Review: Norah Jones – ...Featuring". Seattle Post Intelligencer. Hearst Corporation. Retrieved May 13, 2011. ^ "...Featuring Norah Jones – Norah Jones". CBS Interactive. November 16, 2010. Retrieved May 13, 2011. ^ Keefe, Jonathan (November 14, 2010). "Norah Jones: ...Featuring Norah Jones". Slant Magazine. Slant Magazine. Retrieved May 8, 2011. ^ "...Featuring Norah Jones". Allmusic. Rovi Corporation. Archived from the original on December 18, 2010. Retrieved May 13, 2011. ^ Rizik, Chris. "Norah Jones – ...Featuring (Advance Review) (2010)". Soul Tracks. Soul Tracks. Retrieved May 13, 2011. ^ "Grammy Award nominees in top categories". USA Today. Gannett Company, Inc. February 7, 2005. Retrieved May 11, 2011. ^ "Past Winners Search". The Recording Academy. Retrieved July 23, 2011. ^ Abrams, Todd. "Here We Go Again For The First Time". Billboard. Nielsen Business Media, Inc. Retrieved August 2, 2011. ^ "52nd OEP Category Description Guide" (PDF). Grammy.com. Archived from the original (PDF) on October 27, 2009. Retrieved May 10, 2011. ^ "September 18, 2004 Billboard Hot Digital Tracks". Billboard. Nielsen Business Media, Inc. 116 (38): 73. September 18, 2004. ISSN 0006-2510. Retrieved May 10, 2011. ^ Mayfield, Geoff (September 18, 2004). "Over The Counter". Billboard. Nielsen Business Media, Inc. 116 (38). ISSN 0006-2510. Retrieved May 8, 2011. ^ "October 2, 2004, Billboard Hot Digital Tracks". Billboard. Nielsen Business Media, Inc. 116 (40): 57. October 2, 2004. ISSN 0006-2510. Retrieved May 8, 2011. ^ "Here We Go Again – Single". iTunes Store. Apple Inc. Archived from the original on November 12, 2012. Retrieved May 9, 2011. ^ Williams, Paul (February 26, 2005). "Eight Awards Spark 120% Sales Hike For Duets Album: Grammy Haul Sends Charles Up UK Chart". Music Week. United Business Media: 5. ISSN 0265-1548. ^ "Billboard: Other Charts". Billboard. Nielsen Business Media, Inc. 117 (9). February 26, 2005. ISSN 0006-2510. ^ Mayfield, Geoff (March 5, 2005). "March 5, 2005 Billboard Hot Digital Songs/March 5, 2005 Billboard Pop 100". Billboard. Nielsen Business Media, Inc. 117 (10). ISSN 0006-2510. Retrieved May 8, 2011. ^ "Billboard: Other Charts". Billboard. Nielsen Business Media, Inc. 117 (10). March 5, 2005. ISSN 0006-2510. ^ a b "Here We Go Again [Single, Enhanced, Import]". Amazon.com. Retrieved May 9, 2011. ^ "Ray Charles with Norah Jones – Here We Go Again". Austriancharts.at. Hung Medien. Retrieved May 9, 2011. ^ "Ray Charles with Norah Jones – Here We Go Again". Lescharts.com. Hung Medien. Retrieved May 9, 2011. ^ Doe, John (2004). Genius Loves Company (booklet). Ray Charles. Beverly Hills, CA: Hear Music/Concord Records. p. 4. CCD-2248-2. ^ Whitburn, Joel. Joel Whitburn's Top Country Single. ^ Albert and Hoffmann, p. 101. ^ "Billboard's Top Single Picks (for the week ending 10/9/82)". Billboard. Nielsen Business Media, Inc. 94 (40): 63. October 9, 1982. ISSN 0006-2510. Retrieved June 5, 2012. ^ "Hee-Haw Season 15, Episode 9, Aired Nov 06, 1982". TV.com. Retrieved June 5, 2012. ^ "Billboard Hot Country Singles (Survey for week ending 10/30/82)". Billboard. Nielsen Business Media, Inc. 94 (43): 44. October 30, 1982. ISSN 0006-2510. Retrieved June 5, 2012. ^ "Billboard Top Album Picks (Survey for week ending 10/30/82)". Billboard. Nielsen Business Media, Inc. 94 (43): 64. October 30, 1982. ISSN 0006-2510. Retrieved June 5, 2012. ^ "Billboard Hot Country Singles (Survey for week ending 11/27/82)". Billboard. Nielsen Business Media, Inc. 94 (47): 45. November 27, 1982. ISSN 0006-2510. Retrieved June 5, 2012. ^ "Billboard Hot Country Singles (Survey for week ending 12/11/82)". Billboard. Nielsen Business Media, Inc. 94 (49): 48. December 11, 1982. ISSN 0006-2510. Retrieved June 6, 2012. ^ Albert and Hoffmann, p. 67. ^ "Billy Vaughn – Ode To Billy Joe". Discogs. Retrieved May 10, 2011. ^ a b "Here We Go Again: Dean Martin". Allmusic. Rovi Corporation. Retrieved May 10, 2011. ^ a b "The Last Time I Saw Her: Glen Campbell". Allmusic. Rovi Corporation. Retrieved May 10, 2011. ^ "Lonely People: Eddy Arnold". Allmusic. Rovi Corporation. Retrieved May 10, 2011. ^ a b "Here We Go Again: George Strait". Allmusic. Rovi Corporation. Retrieved May 10, 2011. ^ "Here We Go Again". Amazon.com. Retrieved May 14, 2011. ^ "Reba Duets". Amazon.com. Retrieved May 14, 2011. ^ a b Baret, Nathalie (August 17, 2007). "Review; Red Steagall". ABQ Journal. ABQ Journal. Retrieved May 17, 2011. ^ "Reviews". Cashbox. Cashbox Magazine, Inc. Archived from the original on September 18, 2010. Retrieved May 10, 2011. ^ "Here We Go Again: Red Steagall". Allmusic. Rovi Corporation. Retrieved May 10, 2011. ^ "The Red One". Last.FM. Retrieved March 27, 2013. ^ "The Red One: Little Willie Littlefield". iTunes. Archived from the original on March 5, 2016. Retrieved March 27, 2013. ^ "Peters & Lee - Here We Go Again (song)". Italiancharts.com. Retrieved March 6, 2019. ^ "Joe Dolan – Here We Go Again". Discogs. Retrieved March 6, 2019. ^ "Joe Dolan: Here We Go Again". Allmusic. Retrieved March 6, 2019. ^ "Joe Dolan - Here We Go Again (song)". Italiancharts.com. Retrieved March 6, 2019. ^ Oquist, Kenneth E. (April 1, 2011). "'Here We Go Again': Live Ray Charles Tribute from Willie Nelson, Wynton Marsalis, and Norah Jones". A&E Playground. Retrieved May 8, 2011. ^ "Here We Go Again: Celebrating the Genius of Ray Charles". WillieNelson.com. Archived from the original on May 30, 2011. Retrieved March 22, 2011. ^ a b Tilland, Bill (March 23, 2011). "Marsalis and Nelson join forces once more, with help from Norah Jones". British Broadcasting Corporation. Retrieved August 5, 2011. ^ Chinen, Nate (February 10, 2009). "Much Brass, a Bit of Twang and Plenty of Ray Charles". The New York Times. The New York Times Company. Retrieved August 6, 2011. ^ Layman, Will (April 1, 2011). "Willie Nelson and Wynton Marsalis featuring Norah Jones: Here We Go Again". PopMatters. PopMatters Media, Inc. Retrieved August 5, 2011. ^ Nash, Alanna (May 15, 1992). "Music Review: Holding My Own". Entertainment Weekly. Time Warner. Retrieved August 5, 2011. ^ "Holding My Own: George Strait". Allmusic. Rovi Corporation. Retrieved August 5, 2011. ^ "Holding My Own: George Strait". iTunes Store. Apple Inc. Retrieved August 5, 2011. ^ Steadman Watson, Wallace (1996). Understanding Rainer Werner Fassbinder: Film As Private and Public Art. University of South Carolina Press. p. 76. ISBN 1570030790. ^ "Ray Soundtrack CD". CD Universe. Retrieved June 6, 2012. ^ "More Music from Ray Soundtrack CD". CD Universe. Retrieved June 6, 2012. Albert, George; Frank Hoffmann (1984). The Cash Box Country Singles Charts 1958–1982. Scarecrow Press, Inc. ISBN 0-8108-1685-7. Charles, Ray; Ritz, David (2004). Brother Ray: Ray Charles' Own Story (Third Da Capo Press ed.). Da Capo Press. ISBN 0-306-81431-5. Evans, Mike (2005). Ray Charles: The Birth of Soul. Omnibus Press. ISBN 978-1-84449-764-5. "The Lawrence Welk-Hee Haw Counter-Revolution Polka"